"As The World Turns," "Days of Our Lives," "Celia Cruz," wait -- what? Telemundo has joined a cadre of networks that are focused on attracting the bilingual Latino audience. The network is airing a new "telenovela" about Celia Cruz, the Cuban-American, New York and New Jersey-bred, Salsa queen. The show is a mix of Spanish and English and aimed at a bilingual U.S. Latino audience. Her music is popular in Latin America, but she's absolutely revered by U.S. Latinos, especially on the East Coast. Celia, as she's known, passed away in 2003, in Fort Lee, N.J.
"I've never been into soap operas or telenovelas before, but I'm hosting 'Celia' viewing parties at my place in New Jersey now!" says Cindy Rodriguez, the 32-year-old senior editor of Vivala, a new Latina-focused lifestyle and news website. Both English-language and Spanish-language networks are intensifying their focus on young Latinos who mainly consume media in English, buying and producing programming for that audience. HBO Latino is also focused on the demographic. On Thursday the Spanish-language network screened a new documentary that will air on Friday -- in English -- called "The Poet of Havana." It's the story of Cuban singer Carlos Varela who has achieved a tremendous international following. He is virtually unknown in the United States. HBO's documentary may change that. "Besides the moving and inspirational story, 'The Poet of Havana' is a concerted move by HBO Latino to consistently acquire content in English and in Spanish," said HBO's VP of multicultural marketing, Jackie Gagne at the New York screening. "In essence we want to mirror our U.S. audience, which is mostly bi-lingual." She pointed out that in November the regular HBO channel will air a new Tommy Motola-produced documentary: "The Latin Explosion: A New America." It will look at the impact that Latino music and musicians in the United States have had on American history and culture. Among those who will be featured are: Shakira, Jennifer Lopez, Pitbull, and Gloria Estefan. HBO is owned by CNN's parent company Time Warner (TWX). Latinos 25 to 45, particularly women, are a coveted demographic because by-and-large they're college-educated, employed, digitally connected and vocal on social media. Unlike the seemingly never-ending American soap operas, Novelas traditionally have a beginning and an end, with story lines that span a few months or a few years, and they're popular with older Latinas. To attract a younger audience, the Spanish "novela" format seems to be changing. 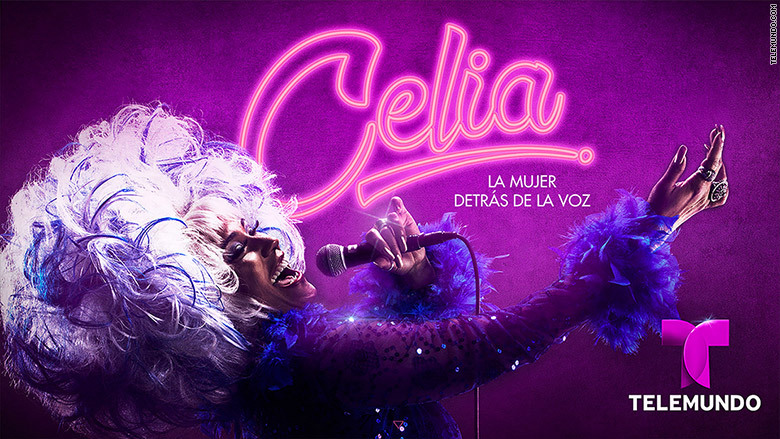 Telemundo's "Celia" resembles what American audiences would recognize as a mini-series or biopic. Univision and Disney have Fusion, a TV and internet news channel focused primarily on Millenials, but it dedicates a good amount of coverage to Latino issues and includes "America with Jorge Ramos. But besides Fusion, it's unclear how Univision is planning to address its disappearing Spanish-speaking audience. It recently lost "Sabado Gigante" a popular variety show hosted by the venerable Dom Francisco. While many in Latin media expressed nostalgic feelings about the show going off the air, some were happy to see it go. The Guardian website posted an opinion piece by Aura Bogado titled "Latinos outgrew Sábado Gigante's racism and misogyny long before it ended." Last month, Lorne Michael's Broadway Video announced it's teaming up with SNL veterans Horatio Sanz and Fred Armisen to create a digital comedy channel aimed at the English-speaking Hispanic audience.